MyLuxury1st© is an online brand specializing in 100% Real Human Hair Extensions and Pigment Colorants for Soaps, Candles, and Cosmetic making made in the USA. Sold exclusively on Amazon, eBay, and Etsy but can be customized or purchased here @ MyLuxury1st.com - a Big Cartel shop for Entrepreneurs worldwide. Founded in 2011, this 1 person company is owned & manufactured by Denyce@Hairdresser.net, who specializes in modern extensions that are 100% hand made into Clip ins, Nail Tips/U shape, Flat Fusion, Stick I tips, Micro bead loop, & Remy Tape in hair extension systems; as well as Iron Oxides, Ultramarines, Micas, Liquids, and solid pigment coloring options for your personal Soaps, Candles, and Cosmetic craft making items. The MyLuxury1st Pigment Dolly was created in late 2012 where 11 most used Iron Oxides and Ultramarine pigment samples were offered in 1 gram increments in order to give customers a chance to test out colorants for their products before buying in bulk. Denyce was the 1st to bring this idea to the internet and quickly became the #1 small time selling pigment distributor. Soon copycats followed suite. Seeing the trend, Denyce decided to offer customized pigments as well which are now made in Southern CA and shipped on a weekly basis. 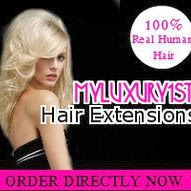 MyLuxury1st® Hair Extensions are handmade with high standard, quality 100% Real human hair. These extensions are available for all women, hairdressers, stylist, and salons. Men are wearing them too! Most of the hair systems are fairly new to the market and can be customized in a range of lengths, colors, & weight. The texture for these modern hair extensions are Asian, European, and Indian blended made soft, silky, & smooth which make them suitable for all ethnicities with naturally straight or very relaxed hair & available in Remy or non Remy silky, soft, & smooth cuticles. With a degree in Business Administration, working in the Small Business Manufacturing industry since 2008 and with an extensive background in customer service relations; Denyce truly knows what makes MyLuxury1st stand out from all other on and offline competitors out there. "Being a small business owner and a work at home mom, I know that it can be frustrating ordering online, so I try to make it very easy for my customers to get in contact and stay in contact with me" says Denyce, owner of MyLuxury1st; who processes & ships every order on her own and is very thorough and hands on in all aspects of her business. MyLuxury1st® is a Registered Trademark and also has a small consignment shop thruogh eBay Stores.